If you are planning a trip to New York City, make sure you take a day or two to get out of the urban metropolis and visit the beautiful North End of Long Island. You can drive here in less than two hours (if you time it to avoid rush hour). You can also take the Long Island Rail Road. Greenport is the last stop and where you want to get off! We would recommend you stay for at least one night, if not two, so you can enjoy multiple aspects of the North Fork. So the first thing to take care of is reserving yourself a room in our romantic North Fork bed and breakfast. Wow – That’s a lot of wineries for one little island! Next for your North Fork weekend should be winery tours. If you have a car with you on the island, it is easy to transport yourself from one winery to the next in our small grape-growing region. However, if you took the train or would rather leave the driving to someone else, there are lots of tour companies that will provide not only transportation but fascinating information and insight on the Long Island wine scene. One such group is Vintage Tours, but there are others. When you make your reservations, let us know what kind of experience you are looking for and we can help you make the arrangements. Even if you would prefer a chartered car to set your own route and pace, that can be arranged. There are miles of glorious beaches in North Fork. Surrounded by the Peconic Bay and the Long Island Sound, you should leave yourself time for a beach picnic, bike ride or fishing trip. To enjoy many of the beaches, your car must display a valid parking permit. When in doubt, check with us and heed to the posted signs. Check back for our next blog post all about North Beaches and our favorites! 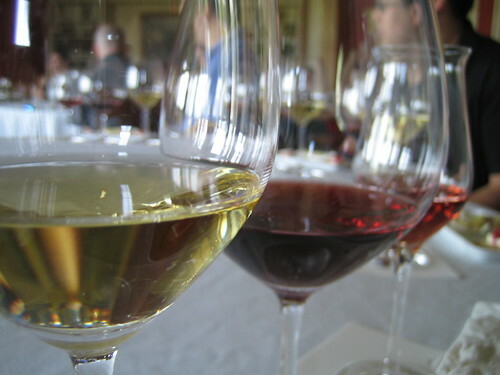 Plan a spring wine tasting tour of Long Island. A 2012 Spring Passport to Long Island Wine Country special is underway through June 1. In other words, this is a fabulous time to come spend a few days at Arbor View House our North Fork Long Island Bed and Breakfast near historic Greenport, NY. You know how fun it is to visit a foreign land and come home with a new stamp on your passport? Well, each time you visit a participating Long Island Winery and purchase a bottle of wine, you’ll get a stamp on your “passport”. A complimentary tasting of a featured wine (with purchase of an any in-house tasting). 2 admission tickets for the price of 1 to the 2012 Taste of Summer event at Old Bethpage Village on June 2. A chance to win an East End Experience Gift Package. In addition, you’ll have had the wonderful experience of visiting many Long Island wineries and trying their wine. Like travel, this will broaden your mind and tantalize your palate! Participating Long Island Wineries are too numerous to list here, but all 35 of them are listed on the Long Island Wine Country website. Rest assured, you’ll find many participating wineries close to our North Fork Long Island Bed and Breakfast. Peconic Bay Winery, Bedell Cellars, and Old Field Vineyards (try their Cabernet Franc) are three of the closest. When you stay with us you’ll get a wine discount card that will increase your savings even more. Plan a Spring Wine Tasting Getaway on Long Island soon, and fill your passport! The small seaside village of Greenport has become famous for its quaint shops, fine dining, and maritime history. Greenport has a colorful history and has long been the home of many famous artists in the past including Walt Whitman, playwright William Gillett, and painter Whitney Hubbard . Today, visitors can spend an entire day just exploring the historic homes of Greenport. Of course, add a lovely lunch, visit a few museums, and do a little shopping and you have created a lovely getaway to Long Island. Museums to put on your list to visit should include East End Seaport Museum, Bootleg Alley, and the shipyards of Greenport. If you are looking for artists, Greenport is still the home of famous artists including award-winning actress Peg Murray, sculptor Arden Scott, crafts-person Gail Horton, and award winning songwriter Hugh Prestwood. With outdoor theater, live music events, and galleries galore, the arts of very much alive in the Village of Greenport. Of course, make sure to have some fun and enjoy a visit to Mitchell Park, which overlooks Greenport Harbor. Mitchell Park has an outdoor amphitheater, harbor side boardwalk, winter ice skating, and public docks which are quite busy during the summer months. 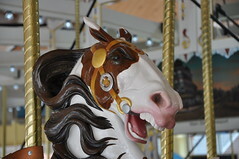 Combine that with Greenport’s famous 40-foot carousel which was built in the 1920’s and donated to the village of Greenport in 1995 and you are sure to enjoy the wonders of visiting Greenport at any time of the year!